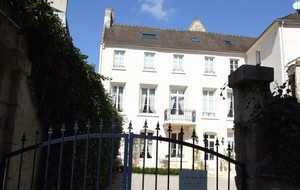 Inthe heart of major tourist attractions Norman city of Caen is a step inside to explore its historic center in this charming mansion. Le Clos Saint Martin is located behind the Place Saint-Martin, is a mansion sixteenth-eighteenth has been nicely restored . The owners have sought to highlight the old materials, which reappear stone and wood ceilings, giving the honor the beautiful spiral staircase leading to guest rooms, ... We should also mention here instead of guest suites, as they are spacious, richly furnished and decorated. Each room has the name of a niece of the hostess, ALBANE, MARY LOUISE or MARGAUX. The gourmet breakfast with candlelight is a must , it is served on individual tables in the dining room. The delicacies reign supreme quality silverware and fine china!